It's true. People are always watching and listening even if doesn't seem like it. You might be feeling discouraged because you've been putting your ideas out there and not receiving feedback but believe me, people see you and they hear you. The catch? Patience. I learned this from doing the Kindness and Gratitude sticker experiment. My track record with executing ideas is pretty terrible--mostly because I'd talk myself out of it before I'd even start, or I'd begin but never finish. I was quite nervous about doing this experiment because I thought no one would care enough to take action. 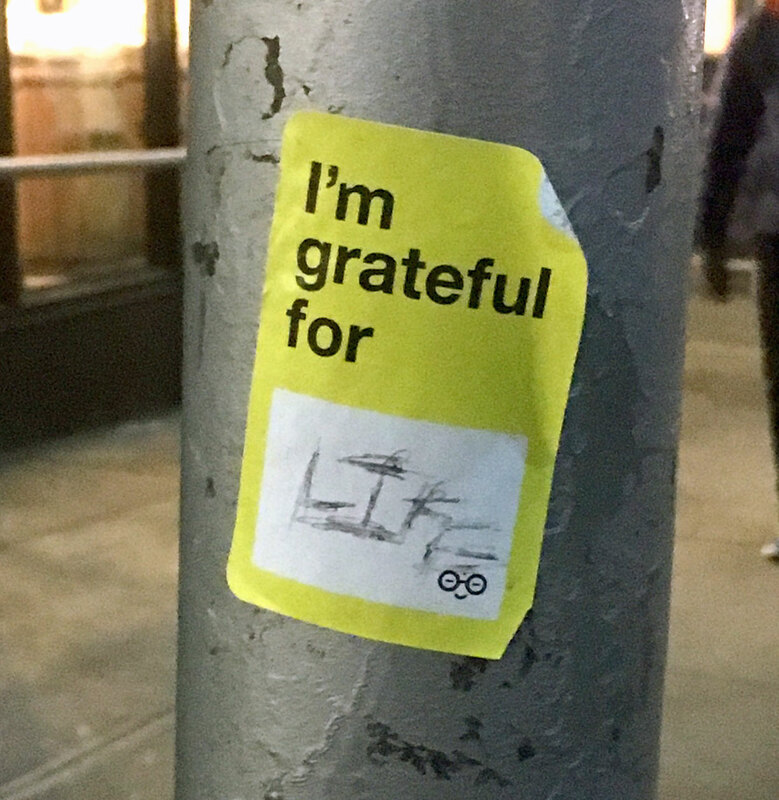 There were two stickers: "I'm grateful for ________" and "The world is a kinder place when ________." I printed a hundred and placed them randomly around the city; a handful were pre-filled but most were not. The larger goal was to get people to participate by filling in the blank ones. Well, no one did it… for a while. After they were placed, I would frequently check to see if there was anything written but it would always be empty. After a while, I stopped seeking them out because I felt like the non-participation proved it was a wasteful idea. I'd put it out of my mind until one day on my way to the train, I passed by one I'd placed along my path and lo and behold, there was something written on it. The word 'Life' had been etched in with what seemed like a pen that was running out of ink. It was clear the person was determined to have their contribution visible. I couldn’t believe it. People probably thought I was nuts when they saw me taking a picture of this random sticker with a clownish grin on my face. When you put something out there and a stranger takes action it's like getting a nudge from the universe. These gestures, however small, validated the purpose of my efforts and was evidence that people do pay attention. It's similar to a musician getting their first listen from a stranger, a podcaster seeing their first download or an artist making their first sale. It's having someone you don’t know find value in your idea and expressing it through engagement. A couple days later, I stumbled upon more stickers in a different part of the city that were also filled out. From left: "Pay for child care instead of wars! ", "Asian Drivers", "Katie"
A. You’ve satisfied that inner voice and need to express the idea. B. You’re a step closer to whatever it is that you’re seeking to accomplish. C. The process of pursing the idea may lead to unexpected opportunities. D. You’ll have created something and it’ll push you to create even more. Give those ideas a fair shot, you might surprise yourself.